11:33 AM – Heading down I-95 in CT towards New York City. Coming up on our lunch break stop in about a half and hour. Now 12 and a seventh-grader, Hall looks forward to being in the 2010 National Cherry Blossom Festival Parade in Washington, D.C., on April 10 as a member of the Woodside One Wheelers, known as WOW. And WOW is more than an acronym for the group; it is also the response Hall and other performers elicit from crowds who watch their acts. The shows feature mostly elementary school students balancing atop circus balls while juggling pins and clubs and doing unicycle routines. The group grew from a one-man show into a nearly 70-student club that meets weekly at the school to practice circus arts. At the center of this ring of intrigue is Eric Pulsifer, the school’s physical education teacher. School Principal Rick Dedek, a member of the Scarborough-based circus arts group the Jim Dandies, helped Pulsifer perfect his juggling skills. The program naturally evolved from there. “Being a teacher, I’m always looking for something different and exciting to offer our kids,” said Pulsifer. He offered juggling lessons to a handful of students who signed up for the program. The pin-tossing segued to balancing moves on top of large circus balls and, by year’s end, the children were riding unicycles. Hank Gilson, 11, also rides one of the 5-foot unicycles, known as giraffes. “It took me about a month and a half to learn. I fell a lot at first and took it home to practice,” he said. Ceci Gilson, mother of Hank and Riley Gilson, 8, also a WOW member, said her boys could not wait to join. Beyond the fitness and agility benefits, Pulsifer hopes to teach kids that they can set and achieve goals by working hard and practicing. “I’ve noticed that most of the kids in our group that are successful are those for whom things do not always come easy,” said Pulsifer. During school performances, club members are asked to share their experiences and goals with the audience. Diane Hall, Courtney’s mother, said the program offers a place for all students who are willing to try, from kids who excel academically and athletically to those who don’t. A parent-teacher partnership purchased the first few pieces of equipment. Registration fees for later programs supplied money for more equipment that today includes five circus balls and about 30 unicycles. At first, the club put in requests to perform at various public and sporting events. Now, it is receiving invitations to do so. The group has a busy spring schedule, including its second halftime show at a Maine Red Claws game April 3 at the Portland Expo. That event will be preceded by the group’s fourth annual community performance on March 12 at Mount Ararat High School in Topsham. However it’s the gig in the nation’s capital that is creating the most buzz. The club also is hosting various events to raise the nearly $20,000 needed to pay for the trip. Hall and her peers meet weekly to work on individual skills and practice group routines for the mile-long parade, in which they’ll likely perform three short programs each about 2 minutes long. 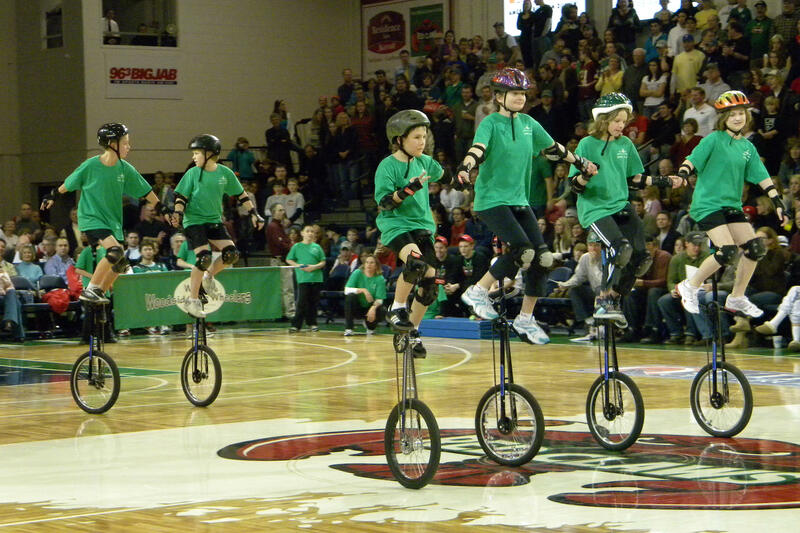 And, they’ll have to do a lot of creative pedaling in between those routines to stay on the unicycles as they wait for others to perform.